Virginia Tech students and professors creatively interpret the meaning of labyrinth through textile constructions and applied technologies. Labyrinth: an intricate combination of paths or passages in which it is difficult to find your way or to reach the exit. This typology of space requires contemplation and awareness. A visitor is constantly in flux, searching for the center, the end. 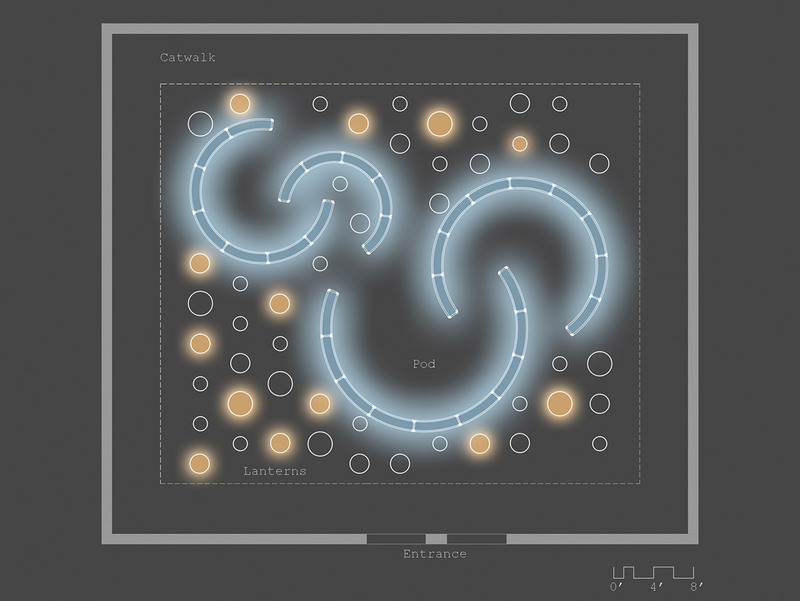 What if the experience of a labyrinth became playful, mysterious, and engaged vertical as well as horizontal space? constantly in flux, searching for the center, the end. Visitors enter a very dimly lit space illuminated by curving fabric walls and long, cylindrical lanterns. The lanterns are dynamically lit by activity beneath them. 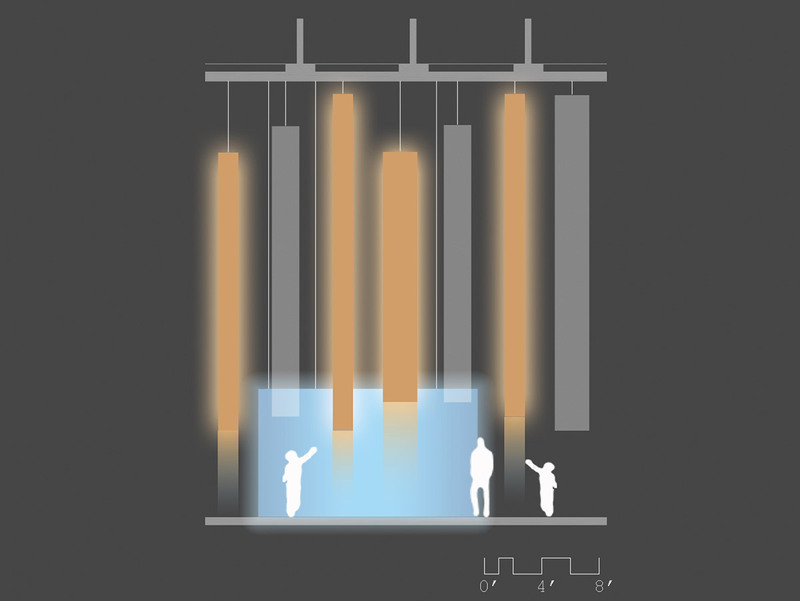 This simple yet elegant interaction grabs visitors’ attention with spontaneous, responsive light. One active lantern can illuminate the entire field of hanging lanterns with light dancing through the darkness. The curving textile walls come alive with silhouettes of visitors moving here and there, seeking to grasp an understanding of this dynamic space, but an understanding of its entirety remains ever so slightly out of reach. This constant play between known and unknown space embodies the intriguing Textile LABYRINTH. Born from a unique opportunity to combine textile fabrication and interactive technologies, the Textile LABYRINTH originated from the course Textile Space, taught at Virginia Tech by Paola Zellner, in collaboration with Tom Martin. The installation took place in the Cube at the Moss Arts Center at Virginia Tech and was sponsored by the Institute for Creativity, Arts and Technology (ICAT). 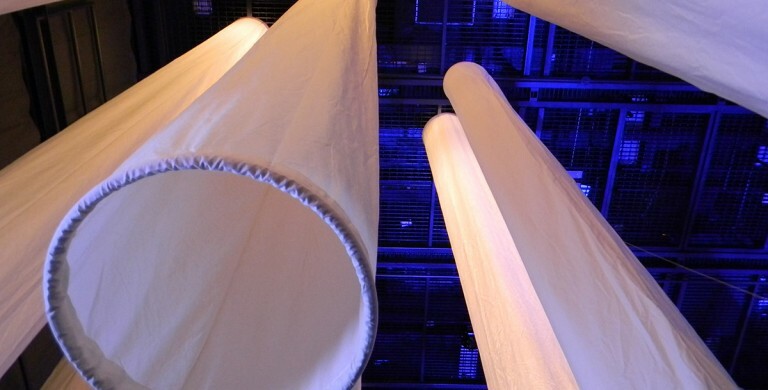 Beginning in Spring 2013, a handful of design and technology students and professors collaborated to conceptualize, develop, and produce the Textile LABYRINTH: perceived endless, horizontal space subtly revealed with dynamic, soaring lanterns. Concept Design: Nikole Branch, Esther Chang, Heather Davis, Rick Fischl, Chris Morgan, Jonathan Runge, Paul Toler, Ben Turpin, and Lily Xiong.